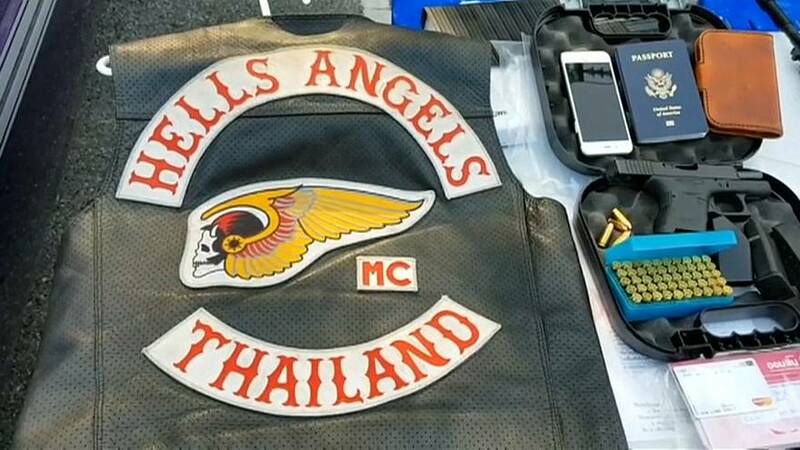 Thai Police have arrested four members of the biker group Hells Angels. The men are being held on drugs charges amongst other offences. They are also being held in connection with the murder of a former member of the group in 2015. Australian Wayne Schneider was found murdered two years ago. His killer, another Australian, was sentenced to death in February. Thai police suspect this attack was due to Schneider's links to the drugs trade. The four arrested men include three Australians and a Canadian. A fifth man who is British has fled the country. The men were arrested in Pattaya, a tourist resort 100km from Bankok. Local police say two of the accused gang members who tested positive for illegal drugs would be deported. Authorites have yet to identify the men. They say they are still looking for three more Australians in connection with the crimes.